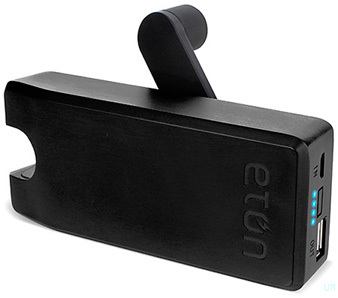 The Eton Boost Turbine 2000 lets you charge your mobile device anytime, anywhere. The Boost Turbine is made of tough, but lightweight aluminum with a sleek and elegant design that will fit right in your pocket. Fast and efficient, one minute of turning will power a 30 second call or a few critical texts. When fully charged it will fully recharge most smartphones. It features an integrated 2000 mAh Li-ion battery, a 4 LED charge indicator, standard USB output and micro-USB input. Supplied with micro-USB cable. Currently available only in white. 3.3 x 7 x 1.5” 13 oz.